It’s official!! 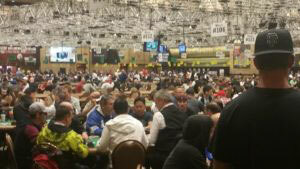 I have arrived at my first WSOP!!! 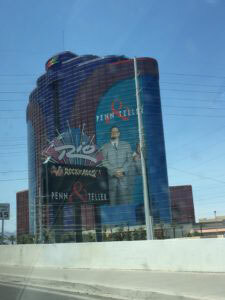 Vegas BABY!! The time has finally come for me to test my poker skills at the biggest and best series in the poker world!! The series last from June 1st til mid July and has every form of poker you can think of, at every imaginable buy in!! There’s even an Online event to play as well! It should be an amazing time, that I will be sure to learn a lot from and remember for the rest of my life! (and hopefully win a life changing score! lol) I have planned a pretty full schedule and with all the other great events going on around town, I’m sure it will be overloaded! 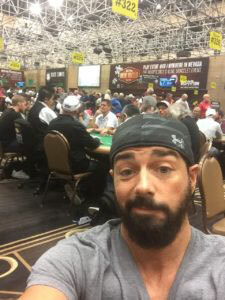 Being my first time here I was pretty nervous about the whole idea of staying in Vegas for 5 weeks, but lucky for me, I have met some great poker friends in my short time of playing professionally, that are showing my the ropes! And after seeing how insane the airport is here, I could not be more thankful! 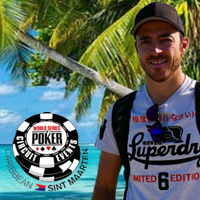 One of them being John Michael Curcuru, who I met in St Maarten, after he also won a satelite through Intertops poker! Just one of SEVERAL rooms! NUTS! We didn’t waste any time after arriving other than to get a quick bite to eat and hit the tables for some small buy in single table sit and go tourneys. Very first hand I get aces! SWEETT, til we get it all in on the flop and the other guy has a set of 6s lol! I didn’t even budge from my seat, cause I knew it was coming and sure enough….BINK ace on the river! lol not a bad way to start off your first WSOP! lol Unfortunately, my luck didn’t run all the way and I came in second. Happy with that part but with the SNGs being winner take all, it was a bummer. We have played a few more since, placing 3rd in two of them, second in another and a 1st place as well. For the Win! lol The 3rd and 2nd places all had deals made at the end to chop in some fashion, so overall profitable. John and I agree there is some really soft play and seems like there’s a lot of easy money to be made in these SNGs if you know what your doing! BUT These were just the warm ups to the BIG money and we are on our way to try our luck at the insanely massive Colossus tomorrow and if that doesn’t go well we will head on over to Planet Hollywood for their Goliath million guarantee! Wish us luck!! Thanks for reading! Run good!